The southwest Detroit neighborhood of Chadsey-Condon has a new reading garden at their local Conley Branch of the Detroit Public Library. 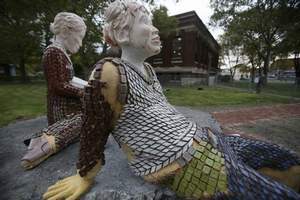 Funded in part by the Skillman Foundation and the College for Creative Studies, the garden features 3D mosaic statuary of a girl reading and a boy gazing at the sky on top of a cement-molded tree trunk in which a five-year time capsule is hidden containing drawings and stories of children from the community. One of roughly 20 art projects in progress or completed in the CCS and Skillman’s Good Neighborhoods program, the garden is intended as a place to nurture not just plant life but the love of books. Due to weather, planting of the actual flowers and foliage has to wait until Spring 2013 but today’s children will be teens when the capsule is unearthed. “I was thinking like, if I, like, drew my mom, dad, my brothers, that people would support their families more,” said Andrew Whitney, 9, a fourth-grader at Advanced Technology Academy in Dearborn about his contributions to the capsule.